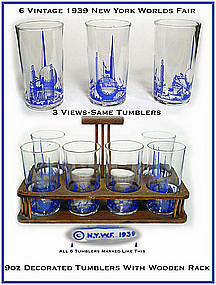 These 6 blue Worlds Fair tumblers are in excellent condition, and come with a rack to hold them. There must have been 8 of them originally but only 6 come with this set. Each one is signed (see photo). The graphics are very good and the decoration is superb!